Multi-tenant messaging for SPs looking to host hundreds to millions of business-level email users, based on a powerful mail server for ISP. 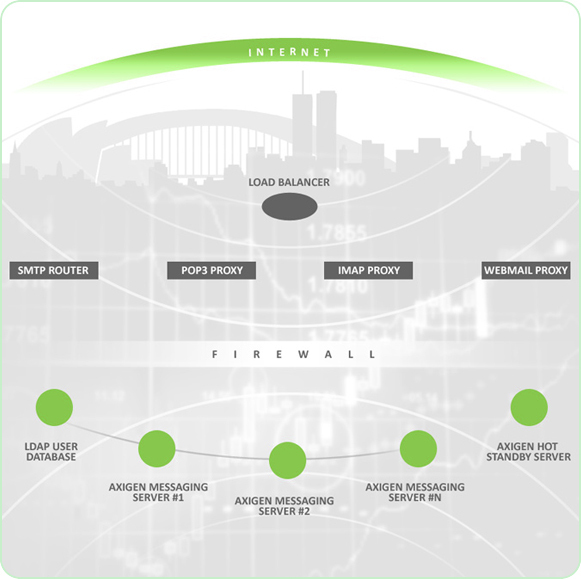 Axigen’s carrier-class mail server is specifically built to provide you with fast & reliable messaging services, leveraging on advanced, proprietary architectures such as Axigen SmartProcessing™ (reduces email processing time to a minimum) & Axigen UltraStorage™ (ensures an effective space management, preventing service downtime or loss of data even at highest traffic peaks). Grant access to customers through various plans, such as SaaS (Software as a Service), collocation, rental or reselling. Also, differentiate between various types of customers by offering them value-added services such as Calendaring, Sharing & Collaboration, or Wireless Mobile Sync. Send / receive email locally from various POP3 / IMAP email clients such as MS Outlook, Mozilla Thunderbird or Apple Mail. Access your WebMail account from mobile devices with Internet access, to check emails, compose / delete messages, set permissions on folders etc. Keyboard navigation & shortcuts, drag-and-drop, “Live” email list view, frequent folders, email filters, individual Whitelist / Blacklist, all the intuitive features of this interface render email related tasks effective & pain-free. The Ajax WebMail also brings multiple, customizable advertising capabilities & allows the integration with 3rd-party ad servers, creating new revenue opportunities for you. Fast & friendly web interface, with HTML email composer, temporary email addresses (account aliases) & RPOP connections. Easily brandable & localized in over 20 languages1, with several skins to be used at the end-user’s choice. Offer your users efficient time-management tools such as calendars, tasks & notes via an easy-to-use Personal Organizer available from WebMail, MS Outlook & iCal (Webcal) compatible clients. Get instant access to relevant data such as emails, contacts or calendars, regardless of time & location, from BlackBerry® devices, via the AstraSync™ or the NotifySync™ client. Configure service specific parameters through Axigen’s Web Administration interface, with quick links & contextual help. Alternatively, automate administrative & provisioning tasks by using the Command Line Interface. Easily monitor the server’s health & activity by using Axigen’s comprehensive charts & statistics, available at server, domain or even sub-domain levels. Integration with 3rd-party reporting applications is also available, via SNMP. Separate services (such as SMTP / IMAP / POP3 etc.) on different tiers to enhance the overall security of the system & to provide service high availability. Store account passwords & routing information in a central point to support the multi-tier setup. Route SMTP / IMAP / POP3 / WebMail connections to the mailboxes distributed on multiple back-end servers. AntiVirus / AntiSpam filtering & differentiated security policies can also be implemented at this level.